On March 1, 2019, the Drs. Foster and Smith Retail Store will be closing its doors. Over the years, we've come to know many of you (and your beloved pets) not just as customers but as friends. From all of us, we'd like to thank the community for their continued loyalty and support over the years. We wish all our friends and neighbors the best. Find us just off Hwy. 8 at 2423 Air Park Rd. in Rhinelander, WI! Click here to map your directions. Be sure to "Like" us on Facebook to stay up-to-date on upcoming events and specials! We carry a large selection of popular freshwater and saltwater fish, along with inverts, corals and more! We also carry any of the aquarium supplies you need. If we don't have it in the store - we'll get it straight out of the warehouse for you if it is available. Interested in more advanced corals and fish? You're welcome to pre-order from our LiveAquaria.com Diver's Den section. Pre-orders must be made 24 hours prior to pick-up. For phone orders please call 1-715-369-9312 during Retail Store business hours, after hours please call 1-800-334-3699. Inform the customer service representative that you will be picking up your order at the Retail Store the following day, and please provide an approximate pick-up time for your order. For internet orders: Place your order as usual, and during checkout, in the comments section, please add a note stating when you will pick up your order. Use the following ship-to address: Drs. 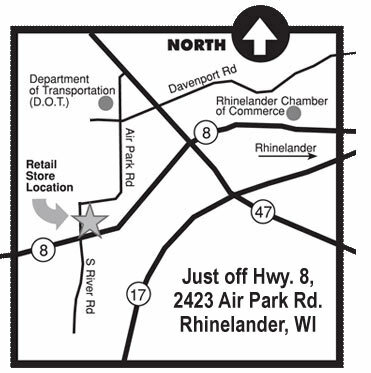 Foster & Smith Retail Store, 2423 Air Park Rd., Rhinelander, WI 54501. Please keep your order number handy, as you will need this to pick up your order at the store.